With TripAdvisor's Hotel Price Comparison search, travelers can access hotel prices and availability directly on the TripAdvisor site. Using this program, you can bid for conversion-ready traffic via live links in these search results. This extension will connect your planyo site with your TripAdvisor listing. The advantage of the TripConnect program is that the customers are driven to your website in order to make the reservation, plus you don't need to pay a percentage-based commission on the bookings (there is a pay-per-click fee, though, similar to Google AdWords). Intergration features: This integration will use both Conversion Tracking and Review Express (only if you opt-in). Conversion tracking: When you add this extension, the simple integration pages (on planyo.com) visited by your customers will include the conversion tracking pixel from TripAdvisor. 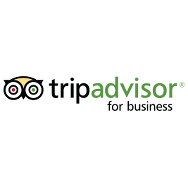 Review Express: Your customers will get an email from TripAdvisor after their stay asking to review your hotel. The Review Express program is independent from TripConnect and this extension is needed in order to automate sending out of the review emails to your customers. CHF 9.9/month Buy monthly subscription to the extension. The extension is hosted on our servers so no installation is required. This is the easiest way to use the extension.